Jokes are a fun way to expose kids to language. Jokes for children learning Spanish can be at any language level and they use a wide variety of vocabulary. Kids love it when they understand the word play that makes a simple joke work. Try the eleven jokes below with your language learners! You can find many more jokes and information about using them with Spanish learners here: Spanish Jokes for Learning and Fun. Some of the following jokes for children learning Spanish depend on the way sounds combine in Spanish, or on how the meaning of a word changes when the gender of the noun is changed. You may have to explain the joke, but that is okay. That is often the case with jokes in English, too. In particular, you may have to break down the sounds in jokes that depend on the double meaning of words that run together. For example, in 7, you may have to explain that ¿espera? (wait) is ¿es pera? 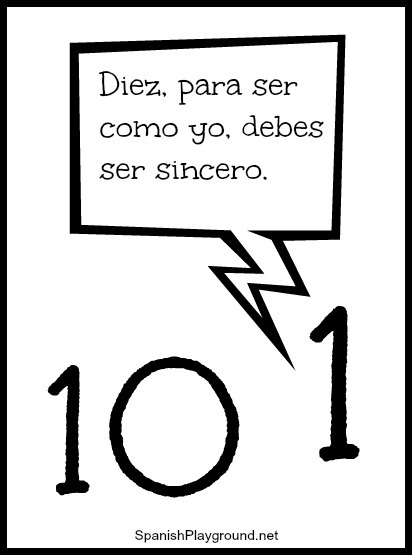 (a pear), or that in 11 sincero (sincere) is sin cero (without a zero). Children will learn if they can understand the joke once you explain it. If possible, establish a context when you tell jokes for children learning Spanish. For example, tell #1, about the waiter and the fish, when you are eating in a restaurant, or #7 about la manzana and la pera when you can point to an apple or a pear. Change your voice for the characters in the joke and use gestures to make the meaning of the Spanish clearer. For example, look up when you tell #3. You will probably be able to tell which jokes have vocabulary that your children will understand. If you are not sure, you can always teach specific words to tell a joke, especially if there are visual cues to give the words meaning. 1. – Mesero, ¿el pescado viene solo? – No, se lo traigo yo. 2. ¿Qué le dice un semáforo a otro? – ¡No me mires porque me estoy cambiando! 3. ¿Por qué miran hacia arriba las focas? Porque allí están los focos. -I’m waiting a little while./ I’m waiting for a little boy rat. 5. – ¿Quieres que te cuente un chiste al revés? 6. – ¿Cómo está tu hijo pequeño? – Hace tres meses que camina. – Pues, ¡ya debe estar muy lejos! – ¿Hace mucho que usted espera? 8. Había un tomate y una pera en la parada del autobus. El tomate le pregunta a la pera – ¿Hace mucho que espera? 9. ¿Qué le dijo la Luna al Sol? -¡Tan grande y no te dejan salir de noche! 10. ¿Cuál es el animal que es animal dos veces? – El gato, porque es gato y araña. 11. – ¿Qué le dice el 1 al 10? – Para ser como yo, debes ser sincero. (What does the 1 say to the 10? – To be like me, you have to be sincere/ without a zero. These jokes for children learning Spanish are authentic resources. Children in Latin America and Spain learn them the same way children in English-speaking countries learn knock-knock jokes. 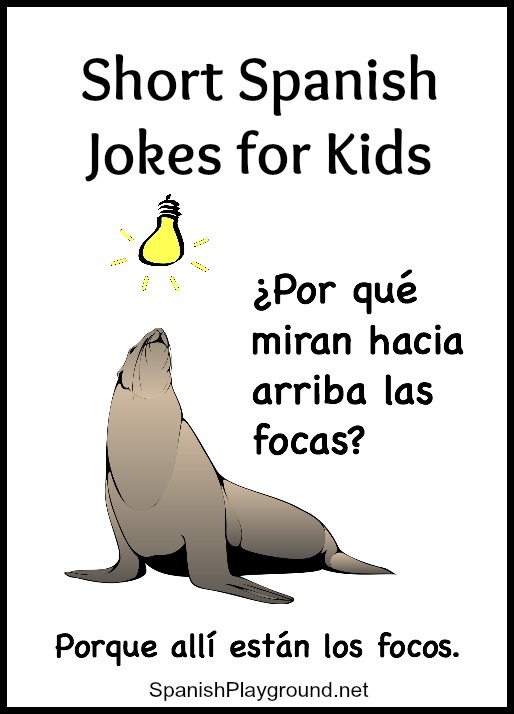 Language learners need support for jokes just as they need support for other new material, but these jokes for children learning Spanish can certainly be used to create comprehensible input. Add humor to your class or family time and keep language learning fun!